A splendid written work about the village from 1943 to 2005 can be found in the main menu, it is entitled Peter James Quakers Yard history. 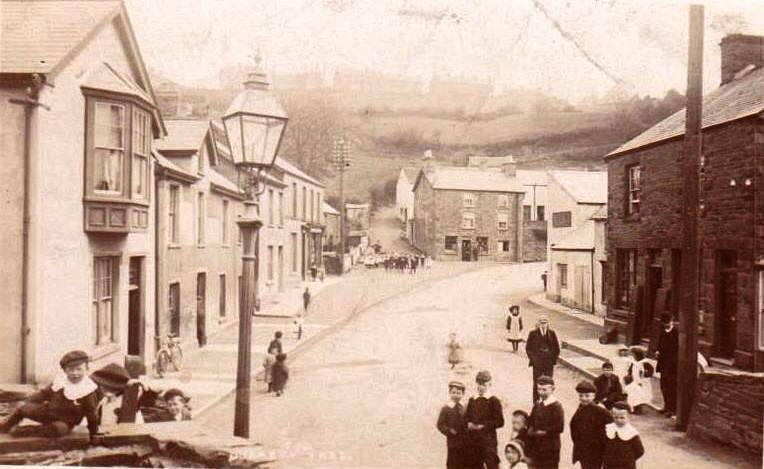 The early place name for the district was ‘Rhyd y Grug’ or ‘The Ford of the Rustling Waters’. This ford was a simple and easy crossing place of the nearby River Taff, close to its junction with the smaller river Bargoed-Taff. 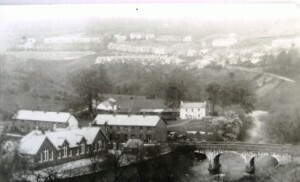 The ford was replaced in later years by the narrow stone bridge over the River Taff. Quakers Yard railway station opened in 1858. During the early 17th century those who ‘dissented’ from the King’s Religion were persecuted. This often took the form of imprisonment, or death. By about 1650 a ‘dissenting group’ of Baptists independents and Quakers were worshipping at nearby Berthlwyd Farm, Pentwyn (Top of the Hill). The Quakers in turn, soon broke away to establish their own separate community. In the year 1667, these Quakers opened their own Quaker burial ground. It was on a piece of land on the Pantannas Estate and was owned by Mary Chapman. In her will of 1700, she left the burial ground to the Quakers. Quakers Yard railway station opened in 1858. 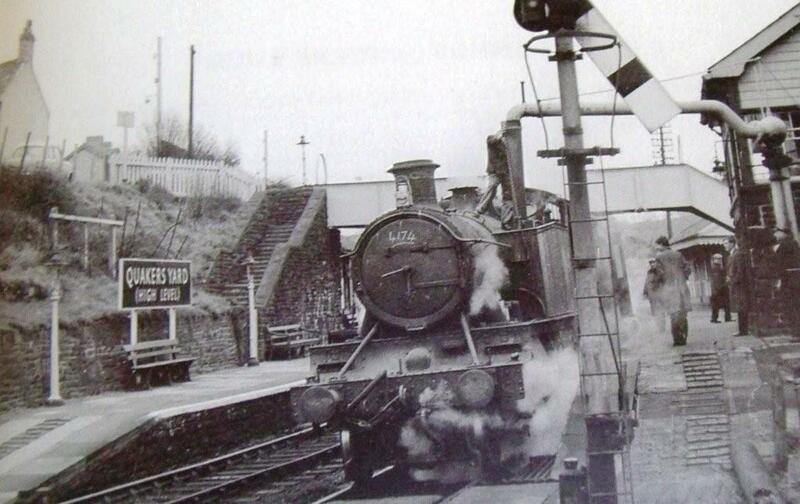 This was the very first station in the Treharris district to be opened, although it would be over 20 years before FW Harris arrived to lend his name to the district. It was not only the first station but ultimately the last station left open in the 21 st Century. Please go to the railways section of this site to read more about the station.The station is actually in Edwardsville which was not a village at the time the station was built. At the turn of the twentieth century, there were five pubs in the village. The very old Quakers Yard Inn and the Glan Taf, together with the White Hart, Victoria Inn and the Carpenters Arms (Fiddlers Elbow). Today just the Quakers Yard Inn and Glan Taff remain. There was also a Royal Antediluvian Order of Buffaloes (R.A.O.B.) club in the village but it is also now demolished and new homes are being built on that site. 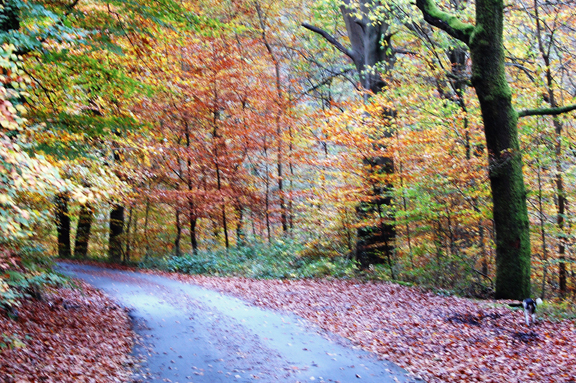 At Quaker’s Yard, the Taff Trail passes above a caravan park along a back lane. The lane (Roderick’s Terrace) is on a steep hill with a blind corner. If following Sustrans National Cycle Network Route 47 (East), drop down Roderick’s Terrace across the bridge over the river and the main road. Turn left at the Quaker’s Yard Inn. Another left takes you across the stream to the mostly off-road route through to Newport via Ystrad Mynach, Hengoed and the Sirhowy Valley. The start of this section is from Roderick’s Terrace and, with the river Taff downhill to the left, along the back lane of the houses. We go past the caravan park and across the river on a narrow footbridge. Follow the lane in a deep valley, with the main roads crossing on viaducts high above, through to Tram Road Side at Abercynon. The start of this section is from Roderick’s Terrace and, with the river Taff downhill on the right. Straight ahead, we are soon alongside the river leaving the houses behind running in a deep valley with various used and disused stone railway bridges high above. Passing the end of the path from Quakes Yard Station, the route again takes on a rural feel. The best known of Trevithick’s locomotives was the one he made to carry iron along the cast iron tramway from the Pendarren ironworks to the Glamorgan canal. The iron was loaded onto barges at Abercynon. It was he said, ‘the first and only self-moving machine that ever was made to travel on a road with 25 tons at 4 mph, and completely manageable by one man’.